L. Robert Baker received a BS degree from Brigham Young University in 2007 and a MS degree from Brigham Young University in 2008. He received his PhD from the University of California, Berkeley under the supervision of Gabor Somorjai in 2012. Following his PhD he performed postdoctoral research with Stephen Leone before joining The Ohio State University as an assistant professor in 2014. His research interests are in ultrafast spectroscopy, heterogenous catalysis, and surface science. 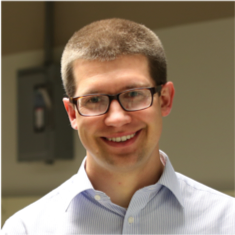 He is a recipient of the Air Force Office of Scientific Research Young Investigator Award and the Department of Energy Early Career Award.